Copthall’s mission to provide an ‘Excellent Education for All’ has seen strong pass rates in the diverse subjects of English Literature, History, Art, Product Design and Religious Education. Students at Copthall Sixth Form were thrilled to discover they had been awarded excellent grades in their A Levels, with 65% securing places at their first choice university. Nearly 15% of students will progress on to the prestigious Russell Group universities to study a range of disciplines such as Microbiology, History and Midwifery. 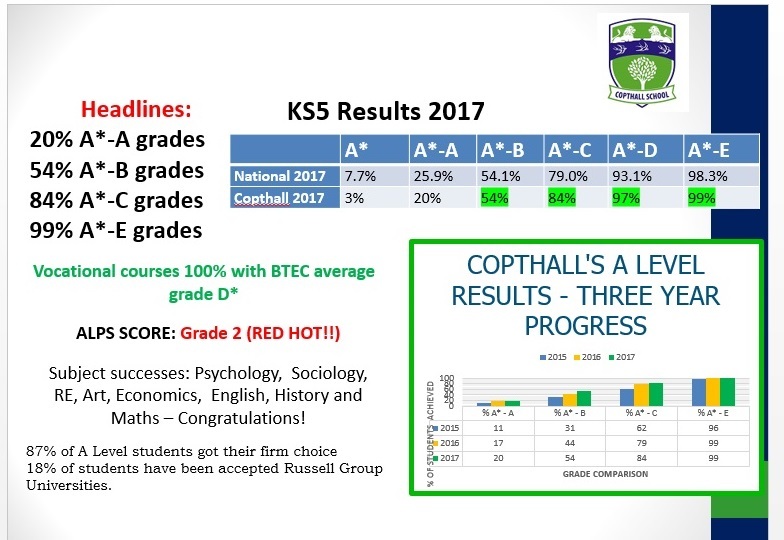 In May 2018, Copthall received a ‘Good’ Ofsted judgement, particularly highlighting the strong leadership in the Sixth Form, and this year’s results are testament to the schools continued commitment to ensuring every girl fulfils her potential and leaves the Sixth Form ready for future success in a global workplace. The curriculum offered in the sixth-form provides opportunities for students to study a range of appropriate courses. This includes a number of vocational courses which also proved to be successful with the average result for all Applied General (BTEC) courses achieving a Merit with Beauty students achieving Distinction passes. Director of Sixth Form, Ami Patel, "I am so proud of every one of our students today, well done and congratulations to you all. The achievements are a testament to the hard work and commitment of our students, staff and parents. We wish every student well in their bright future ahead and remember to work hard, aim high and make it count. Headteacher, Evelyn Forde – “I am delighted that despite the new A-Level specifications which are significantly more rigorous than before, many of our students have done very well and secured places at Nottingham, Queen Mary and Kings. The strong leadership in the Sixth Form as noted by Ofsted, will ensure that our outcomes will go from strength to strength. Copthall Sixth Form succeeds with 100% pass rates secured in the diverse subjects of English Literature, Economics and Sociology. Students at Copthall Sixth Form were thrilled to discover they had been awarded top grades in their A Levels, with nearly 90% securing places at their first choice university. Nearly 20% of students will progress on to the prestigious Russell Group universities to study a range of disciplines from Law to Biomedical Sciences. As overall results demonstrated an upward trend for the Sixth Form, 84% of students managed to achieve top A*-C grades, taking the school’s performance above the national average by nearly 7%. The results are proof of Copthall’s commitment to ensuring every girl fulfils her academic potential and leaves the Sixth Form ready for future success in a global workplace. As part of their commitment to offering a broad curriculum, Copthall offer vocational courses including Beauty and Health and Social Care, which proved to be just as successful with the average result for Health and Social Care being Distinction* and for Beauty it was a Merit. Director of Sixth Form, Ami Patel, was delighted by the results achieved by Copthall students, commenting: “We have once again enjoyed scenes of elation and happiness as our students have achieved excellent post-16 results, with improvements across a multitude of subjects and courses. Their success is a testament to their hard work and commitment and we are very proud of them all and very excited to hear about their futures." Evelyn Forde took on the role of Headteacher at Copthall School in September 2016. Evelyn said: "I am immensely proud of our Year 13 students today. Their achievements are a result of great teaching, hard work and dedication. Well done to students and staff alike!" Elizabeth achieved an impressive A*, A*, A and is excited to take her place at Russell Group University, Nottingham, where she will study Psychology. Spogmay, who will take up her place at Queen Mary University, where she will study Law after receiving A Sociology, A History and B Psychology. Samira, A Biology, A Chemistry, A Psychology. Samira will continue her studies at UCL, where she will study Pharmacy. Simran has achieved an impressive A English Literature, A Photography and B Psychology and cannot wait to join Middlesex University to begin her studies in Primary Education. Iqra, Copthall Head Girl achieved an incredible A*, A, A, B and is the only student at Copthall to study 4 A-Levels. Iqra is taking a year out from studying, before studying a Veterinary Medicine course, with the aim to become a large animal surgeon. Antonia, A* Psychology, A Sociology, B History and has secured her place at Surrey University to study Psychology. Nadia N has successfully gained a place at Lancaster Univerisity to study Medicine, after achieving an impressive AAA.